Her feedback was spot on and had me pause and reflect more deeply on my own relationship to the truth. Authenticity, as you may know, is something that’s very important to me both personally and professionally. Even though I’m comfortable admitting that authenticity is something I find challenging at times, which is one of the reasons why I chose to write a book about it and enjoy speaking about it (I’m a big believer in the principle of “we teach best what we most need to learn,”) as I started to look at this more honestly in my own life, I realized that it’s one thing for me to talk and write about authenticity, and it’s a whole other thing for me to actually be authentic in the moment with myself, the people around me, and in the most important situations in my life. I often ask the question, “What does it actually mean to be authentic?” The answer to this question varies quite a bit depending on who I’m talking to and continues to evolve for me personally. In the past few months I’ve had some deeper insight into what authenticity truly means. I now see it on a continuum. I spoke about this specifically and shared some personal stories in the recent TEDx talk that I gave on The Power of Authenticity (click here to view the video of this talk). The three main elements on this continuum are: phony, honest, and authentic. On one side of the continuum is what I’ll call “phony.” We all know what this is like and we all have experience in life being phony (i.e. being inauthentic). Most of the time it’s not malicious; we’re not trying to deceive people or lie in an overt or harmful way (although sometimes we are). It usually has to do with withholding or massaging the truth, spinning things in a certain way, or doing or saying what we think we’re “supposed” to in order to look good, get what we what, or simply not cause a problem. While this can sometimes be benign, operating from this place of phoniness is stressful, it’s not conducive to building trust with others, and it isn’t sustainable or healthy for us on many levels. As we move along the continuum, we get to the midpoint which is what I’ll call “honest.” Honest is much better than phony as we’ve been told from the time we were kids. “Honesty is the best policy,” as the saying goes. However, as we’ve each learned, there are some cases in which honesty is NOT the best policy – at least not in terms of feeling good, avoiding conflict, and getting what we want. Honesty can be a little tricky because we’ve all had experiences in life when we’ve been honest, but in doing so, we’ve created a problem, hurt someone’s feelings, or made a bigger issue out of something than needed to be made. We’ve been honest at times and it’s been bad for us, made us look bad, it’s been controversial, and more. Due to these negative experiences and consequences we’ve had in the past, we sometimes shy away from honesty. Another challenging aspect of honesty is that oftentimes we say we’re just “being honest” when really we’re being right and/or judgmental. It’s our righteousness and judgments that create separation between us and other people, not the actual honesty. We justify our righteousness with “honesty,” which is often a smokescreen for making other people wrong and/or feeling as though we’re superior to them. Due to the complexities and difficulties with honesty, we spend a lot of time in life oscillating between phony and honest – wanting to mostly be honest, but to do so in a politically correct way, or at least in a way that’s not too offensive, problematic, doesn’t create problems for us or other people, and gets us what we want. However, there’s not a lot of freedom in these two aspects of this continuum. The true freedom lies beyond honesty. Authenticity is on the opposite side of the continuum from phony. It’s absolutely honest, but minus the righteousness and plus vulnerability. It’s the vulnerability aspect of authenticity that’s both liberating and challenging. It’s scary for a lot of us, myself included, to be vulnerable – especially at certain times, with specific people, and in particular situations. We’ve been taught and trained not to make ourselves vulnerable. We’ve allowed ourselves to be vulnerable in the past and people have hurt our feelings, they’ve manipulated us, and they’ve used things against us. Based on these types of experiences (and our fears of these or other “bad” things happening), we have a tendency to protect ourselves from vulnerability. It’s our ability to embrace vulnerability which allows us to experience true authenticity, and thus true freedom and power in life. I’m a big fan of the work of Brene Brown, author of the best-selling book Daring Greatly and professor at the University of Houston. She has given a few very successful TED talks on vulnerability which you may have seen. Brene is a behavioral psychology researcher who has studied vulnerability, shame, and fear for over a decade. What she has found in her research is that vulnerability liberates us from our erroneous and insatiable obsession with perfection – thinking we have to be perfect and can’t make mistakes, have flaws, or be human. In other words, being vulnerable allows us to let go of the pressure-filled, stress-inducing, perfection demands we place on ourselves. Vulnerability is also the fundamental element of building trust and connection with other human beings. 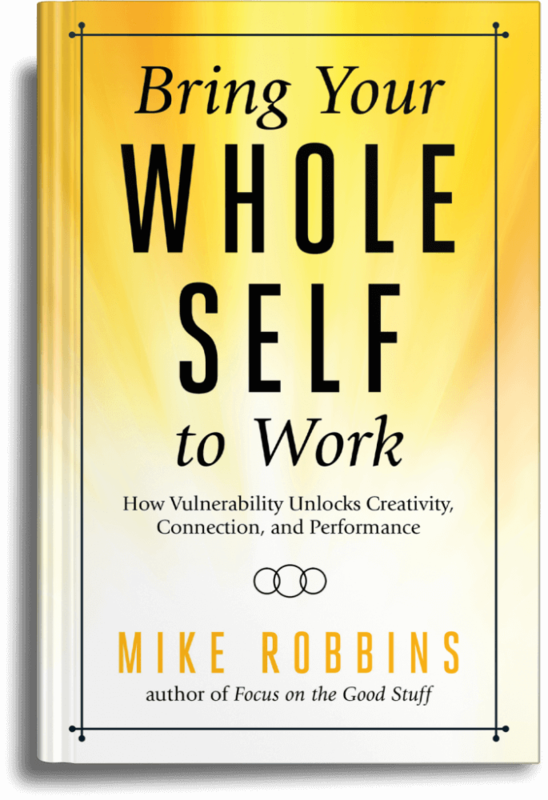 Our ability (or inability) to be vulnerable is directly connected with our ability (or inability) to be authentic. Authenticity is what gives us freedom to be ourselves and be comfortable with who we are, and it’s also what gives us access to connecting with other people in a meaningful and genuine way. This is true power of authenticity and when we embrace it, even though it can be uncomfortable and scary at times, we give ourselves and those around us one of the most important gifts of all – the real us. There is no destination called authentic. Authenticity is a courageous process and a way of being, not a possession or an accomplishment. As the famous saying goes, “There is no way to peace; peace is the way.” The same could be said about authenticity. How do you feel about disappointing others? How about being disappointed yourself? I’ve recently noticed how much of my conscious and unconscious attention is focused on not disappointing others, while at the same time protecting myself against being disappointed. As I’ve been looking at this more deeply, I’m amazed by how much stress, fear, and worry I experience in my attempts to avoid the disappointment of those around me – family, friends, clients, and others. At the same time, I can see that much of this comes from my own deeper fear of being disappointed and let down. The irony, of course, is that no matter how hard I try to avoid disappointing others or being disappointed myself, it happens anyway. By actively avoiding disappointment (of or by others), we set ourselves up for failure and pain. And, as I’ve seen recently, this makes it very difficult, if not impossible, to speak our truth, be ourselves, and live with a real sense of authenticity and peace. What if we embraced disappointment instead of avoiding it? It’s inevitable that we will disappoint people, especially when we live our lives in a bold, authentic, and passionate way. Speaking up, going for the things that are important to us, and taking care of ourselves are all things that at times won’t align with others and in some cases may even upset them. It is possible for us, however, to be mindful, empathetic, and aware of others, and still be true to ourselves – these things don’t have to be mutually exclusive. Asking for what we want, counting on others, and trusting people – all of which are essential for healthy, fulfilling, and real relationships – do make us vulnerable to being disappointed and even hurt by the people in our lives. So what! We end up getting more hurt and disappointed in the long run by withholding our desires and expectations. We might as well live out loud and be honest about how we feel, what we want, and what’s important to us. Disappointment, as uncomfortable and even painful as it can be for me and many of us, is essential and important on our journey of growth, self discovery, authenticity, and fulfillment. Making peace with disappointing others allows us to release our erroneous demands for perfection. Letting go of our fear of being disappointed by other people gives us the ability to take more risks and ask for what we truly want. When we’re able to embrace disappointment, we create a sense of liberation and space that frees us up to be who we truly are and let go of our attachment with other people’s opinions. This is not always easy, but is so powerful and can be transformational. Take inventory. Take an honest look at some of the most important relationships and activities in your life. How many of your actions, thoughts, conversations, and more (or lack thereof) have to do with your avoidance of disappointing others or being disappointed? Also, take a look at your relationship to disappointment in general – how do you feel about it? Expand and express your desires. Make a list (mental or written) of some of the most important and vulnerable desires you currently have – the things you really want, but maybe have been afraid to admit (due to a fear of being disappointed). Many of us, myself included, don’t ask for things, go for things, or express things unless we’re pretty sure we can make them happen, get them, or be sure people will respond to them in a positive way. While this makes sense, it’s also quite limiting. When you allow yourself to tap into and express your authentic desires, even if what you want doesn’t seem “possible” at the moment, you give yourself the freedom to ask, dream, and create. One of my favorite sayings is, “The answer’s always ‘no’ if you don’t ask.” Start asking! As you delve into this, be kind with yourself. This is a big one for me and so many people I know and work with. We all want to be loved, valued, and appreciated in our lives. And, most of us have had painful experiences of disappointment in the past, which have impacted us in a deep way. However, if we can alter our relationship to disappointment – we can transform our lives and our relationships in a profound way! How do you feel about disappointing others? How about being disappointed? What can you do to make peace with and embrace disappointment in an empowering way? Share your thoughts, ideas, insights, actions, and more. How do you feel when things go well for you? If you’re anything like me you may have some mixed feelings about it, as odd as that seems. While I do love it when things go well and when I’m feeling good, I also notice that sometimes it poses certain challenges for me as well. For the past few months, things have been going quite well in my life and with my work. And, more important, I’ve been feeling happier, more peaceful, more grounded, and more vital than I have in quite a long time. All of these things are wonderful, yet I find myself feeling uneasy and uncomfortable with this at some level. Even though I wrote a book called Focus on the Good Stuff and many of the themes that I speak about and write about center around being grateful, appreciative, and fulfilled in life – it can be a little tricky for me to fully embrace and experience my life when it’s going well. Maybe you can relate to this? What is this about? For me and those of us who may struggle with authentic “good stuff?” For me, there are a few main things that come up and get in my way when things start to go really well. Second of all, I worry that people won’t like me, will judge me, or will get jealous of my success or my happiness, and thus pull away from me or withhold their love, appreciation, and approval. Connected to this feeling of separation, I also find myself worrying that if things go too well I won’t be able to relate to, connect with, or be accepted by some of the most important people and groups in my world. Third of all, much of my learning, growth, and evolution in life has come through my own pain and suffering (i.e. “the hard way”). Even though I’ve heard a number of teachers and mentors in my life say that we can grow more effectively and elegantly through joy, peace, and love – I find myself worrying that if things get too good, I’ll get lazy, stop actively learning, or somehow abandon my journey of personal growth, which is one of the most important things in my life. These and other limiting thoughts, attitudes, and beliefs have gotten in my way in the past, kept me stuck in struggle, and at the very least have limited my experience of joy and fulfillment. It’s almost as if I’ve been more comfortable suffering than I have been when things are thriving. When there are issues, dramas, challenges, pains, and other difficulties to deal with, address, heal, and overcome – I’m able to dig down deep, access my power, and rise up to meet them. I’m ready to breakthrough this and alter it in a fundamental and profound way. How about you? Your version of this may look a little different than mine, but lots of people I know and work with, even those who have created a lot of outward “success” in their lives, seem to struggle to one degree or another allowing things to go really well in their lives and doing so with real peace, gratitude, and joy. What if we did allow things to go well and did so more graciously, intentionally, and consciously. My commitment to myself right now as I’m experiencing a period of expanded success, well being, and joy is to both appreciate it fully and allow it to expand and sustain at the same time. Of course life has its inevitably ups and downs, ebbs and flows, and expansions and contractions – but, what if we stopped sabotaging ourselves, our success, and our fulfillment just as we began to experience it or because it got too good for us to handle? Remind yourself that life’s not a competition. This is a big one for me – as a former pro ball player and given the nature of my personality (I’m a 3 on the enneagram), I have a tendency to look at everything in life as a competition, even though it rarely is. Competition is about our negative ego (thinking we are either “better than” or “less than”). When we remember that life is not a competition, we can focus on our own unique experience and do so in a way that is real, not simply in reference to those around us – positively or negatively. Take care of yourself. I’ve heard it said so many times that “happiness is an inside” job, which is true. Oftentimes things become cliche because they are overused, but they are overused because of their universal truth. The better job we do at taking care of ourselves and remembering that our fulfillment in life is much more about how we feel about and relate to ourselves, than it is about what others think of us or what results we produce in the world, the more likely we are to experience a true sense of joy and success. There are a lot of things going on in the world, around us, and in our personal lives – these days and always. Whether we’re dealing with circumstances right now that seem very challenging to us, ones that seem somewhat benign, or ones that seem overtly positive – giving ourselves permission to allow things to go well (and also to enjoy and appreciate when they do), is actually a bold and beautiful step we can take to not only enhance the quality and experience of our own lives, but that of everyone else we come into contact with as well. How do you feel about things going well in your life? What can you do to remind yourself and others that it’s okay for things to go well and for you to be happy? Share your thoughts, ideas, insights, actions, and more on my blog below.